Take one more step on the road of roses. 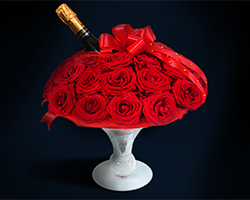 Classic arrangement: vibrant red flowers in vase and brut sparkling, light wine Prosecco. With this composition you may whisper the most gentle of the words.